Rene Doria, IHHELPP president, recently returned from his trip to the Philippines. Doria visited with the LDS and community members in Leyte, Tarlac, and Zambales, recipients of CEB (Compressed Earth Blocks) machines, to discuss production and construction plans using the said machine, in accordance to IHHELPP’s mission to provide livelihood opportunities for Filipinos. Rene travelled to Carigara, Leyte on Feb. 19, 2016 to participate in constructing ‘RISE & REBUILD’s pilot 2-bedroom housing unit built out of Compressed Earth Blocks (CEB). Doria designed the 40 sq. m. unit and headed the construction crew comprised of local ward members whom he described as skilled, hardworking, and fun to be with. 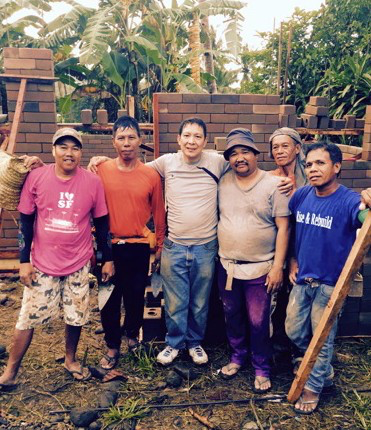 Raymond Goodson, former Manila Mission President and president of RISE AND REBUILD (5013C FOUNDATION) and local ward members constructed communal bathrooms in Leyte where they were severely needed. CEB manufacturing provided immediate employment to 47 members. This number will double shortly to address the need and demand for CEB houses in the area. CEBs provide excellent alternatives to the hollow blocks typically used in the Philippines. Compared to hollow blocks, CEBs are stronger, aﬀordable, and more visually appealing. Manufacturing CEBs within the community provided employment to church members and addressed housing shortage problems that has chronically haunted indigent Filipinos. Rene Doria, Benjamin Cinco and the rest of the construction crew take a break from building the CEB housing unit in Carigara, Leyte. Rene Doria discuss manufacturing of CEBs and housing construction plans with Elson Tabelisima and other community members. ​Bro. and Sis. Doria met with Elson Tabelisma, Camiling West District President, on March 5, 2016, and discussed the bringing of CEB- making equipment to Camiling. These equipment aim to engage church members in manufacturing Compressed Earth Blocks (CEBs) for housing construction in the area. This trip was also a great opportunity to visit the farm dedicated to help Camiling District members establish livelihood programs. With the newly-acquired property adjacent to the provincial road, IHHELPP plans to put up ‘LDS TEC’ (Technical and Entrepreneurial Center) where poor church members can learn livelihood and employment skills to sustain their families. Botolan church members showed tenacity and commitment as they patiently waited for March 5, 2016 to discuss housing and livelihood needs in the area. The first problem they discussed is the need to find elevated land where church members can evacuate during typhoons. Botolan’s sea-level location makes five barangays or community units flood during storms. Communities have been forced to evacuate to higher ground. To date, several church members still live in evacuation centers due to their homes being destroyed by past typhoons. Rex Rubia from Botolan contacted IHHELPP when he found out IHHELPP’s project in Camiling, Tarlac. 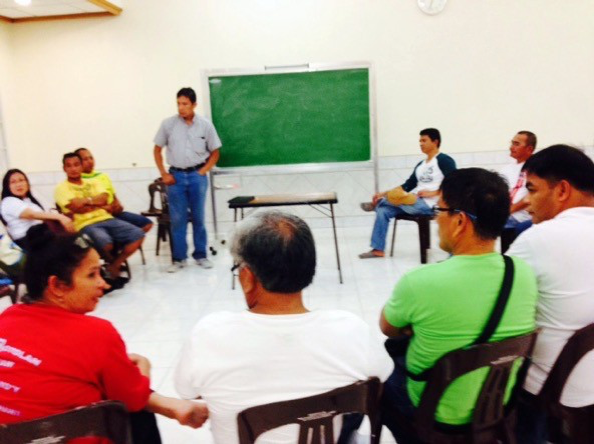 The local LDS church’s welfare committee conducted meetings to follow up the initial discussion on March 5 regarding potential livelihood programs. Rene Doria discuss livelihood opportunities and CEBs with LDS members in Botolan, Zambales. Help us assist the Filipino people to have better opportunities in health, education, housing, and livelihood.100% of your donations are used to further IHHELPP’s programs.